The tooth had been dangling for weeks. Swee’Pea would play with it with her tongue, pushing it out and as it barely hung on to the lower gum and we knew the day was coming when it would fall out. Any day now. For two weeks. But that stubborn little tooth hung in there day after day. I knew, in my heart, I was gonna have to pull it out but the thought gave me the heebie jeebies. But tonight I manned up. I told Swee’Pea it was time for me to pull it out and that it wouldn’t hurt. I told her that I would stop if it began to hurt. She tentatively agreed and I firmly grasped the tiny tooth between my thumb and forefinger, twisted and pulled and… the tooth came out. I showed it to Swee’Pea and I could see in her eyes that it didn’t hurt but that she was not sure how to react. And it was at that moment I felt like a total tool. I consoled her and asked her if she was scared and she nodded her head as I held her close and kissed her tear-stained cheek. We assured her that a new tooth would grow in and that this was, indeed, a great moment. But she wasn’t convinced. She wasn’t convinced, that is, until I pulled out the ultimate go-to comforter. I promised her an extra dessert night to celebrate her losing her tooth. Before we knew it she had negotiated ice cream with whipped cream, chocolate syrup sprinkled with tiny marshmallows. Maybe the sugar-free gum from the tooth fairy will make up for the sugar. Finally, as we talked about the Tooth Fairy’s impending visit, she made it clear that she did not want the Tooth Fairy to take her tooth. 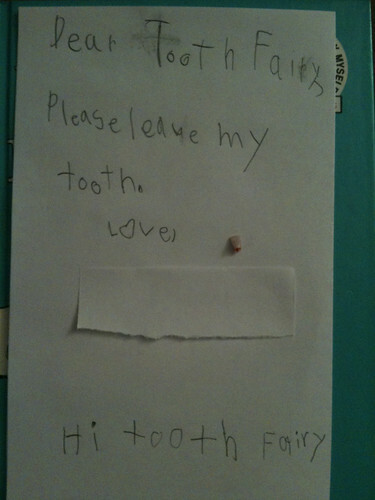 So, we suggested she write the Tooth Fairy a note. Which she promptly did. Of course, TheMonk couldn’t let her have all the fun so he wrote his own addendum to the note at the end. Tomorrow morning Swee’Pea will be $5 and a pack of sugar-free gum richer. TheMonk will be $1 and a pack of sugar-free gum richer because the Tooth Fairy gives both kids gifts for the first lost tooth in our house. And me? I’ll be one note richer. Tucked away for eternity to remember this very special day. We’re not exactly health nuts here at our casita. But we’re not junk food junkies either. It has always been important to us that we raise our kids with an emphasis on healthy eating with fruit, vegetables being staples while soda and sugary drinks are not. We don’t eat fast food all that often and when we do, we explain to the kids that while it’s okay to eat McDonalds food occasionally, the food isn’t very healthy so that’s why we don’t eat it very often. Additionally, we have dessert night once a week. It’s a big deal in our house and every Friday night when I bring home that week’s dessert, there are shrieks of delight the minute I walk through the door – from the kids too. And because we get dessert only once a week, the kids know that it’s not healthy to eat sweets all of the time. Armed with this information, TheMonk and Swee’Pea attended YMCA day camp at my YMCA these past two weeks. One morning, as reported to me by one of my staff, the younger kids were sitting in a circle answering the question, “What’s your favorite food?” Predictable answers from the campers were expressed. Pizza! McDonalds! Ice Cream! When it was time for TheMonk to tell everyone, I wondered what he would say. Nuggets? Pizza? Chocolate cake?